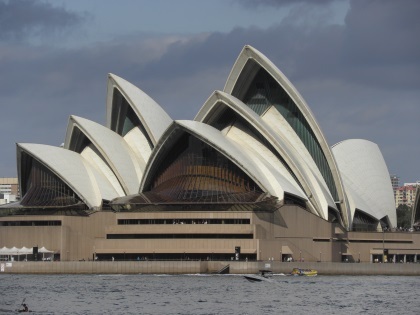 The Sydney Opera House is one of the most distinctive and famous 20th century buildings. It is situated on Bennelong Point in Sydney Harbour. 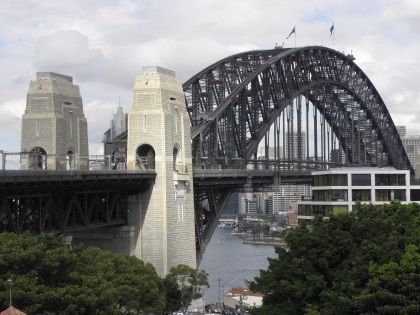 The building and its surroundings (like the Harbour Bridge) form an iconic Australian image. In 1955 a competiton for a design of a large, dedicated opera house and concert hall was started. It was won by the Danish architect Jorn Utzon. It was later finished by Arup & Partners and Australian architects Hall, Todd & Littlemore and Ted Fmer. 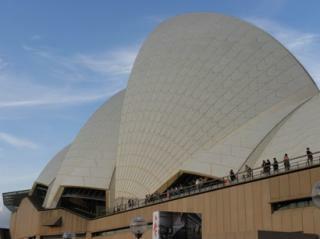 The Opera House was formally opened by Queen Elizabeth II, in her capacity as Queen of Australia, on October 20, 1973. After now having visited Sydney Harbour including the Opera House, I find it a pity that the nomination that finally got succesful in 2007 only covers the Sydney Opera House. 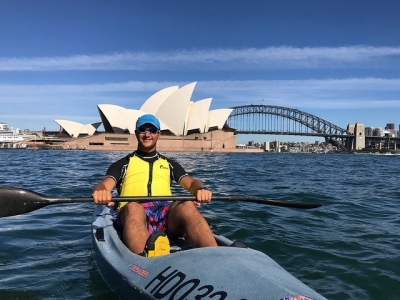 Sydney's Harbour is its great asset, both as a magnet for immigrants in the past and for its picturesque setting. The Opera House is a single great building of course, but I was more impressed by the Harbour Bridge. I "did" Sydney on a half-day bike tour. It took us all along the different quays, over various bridges but allways with the fabulous harbour view in sight. The fish market was a worthy stop for a fresh snack. We cycled around the Opera House too of course. From upclose it is more visible that is actually made of 3 sets of "shells" (it looks one structure from afar). After having read the reviews below, I had decided not to spent another 35 AUS dollar for a tour inside. The complex is very "open" anyway, it is a public building that is used by many. A trip to Sydney is never complete without a visit to the Sydney Opera House, one of the most popular and most visited tourist destinations not only in Australia but arguably in the entire world. Just like any other first timers in the “Land Down Under,” the very first thing I did on my first trip to Sydney (and in entire country-continent of Australia) was to walk my way to this popular man-made Oz-ian destination. The dynamic harbour seems to be embodied by Jørn Utzon’s design: a playful encounter among the different elements found in the area: the gigantic and very busy Harbour Bridge, the imposing muscle-flexes of sea vessels and ferries, and the graceful dances of the yachts and other smaller boats. Also, the architectural design, almost a sculpture-like artwork, is a reminder of the beautiful natural landscape surrounding the bay. According to some online sources, the inspirations of Utzon were the gigantic edifices of the Americas – the pre-Hispanic structures of the Mayans and the Aztecs. In a way, the design was envisioned to be a temple where the public gets to connect with the gods. Others suggest that his inspirations were the huge castles of the Scandinavian region, particularly those from Denmark, his home country. Like what I wrote in the previous paragraph, there are narratives that link the building with the natural and cultural landscapes of the city: the cliffs and the sails of the harbour. At nighttime, the magnificent opera house transforms itself into another art-form: a video installation/video map. I saw this transformation on Youtube and other social media platforms such as Instagram and Facebook. I remember during the 2000 Olympic Games, a video map was projected onto the outer shells of the entire structure. Luckily, during my short visit in Sydney, I was able to see a fifteen-minute wall-mapping video about the original locals / indigenous groups (the Eora People) of the very place where the opera house currently stands. It was an amazing and heartfelt video map even if it was only projected on one of the many outer-shells of the building. For a complete version of this commentary/review, please click here. I visited this WHS in January 2018 and literally viewed this landmark from every angle imaginable over 5 days I spent in Sydney. My better half spoilt me rotten for my birthday by booking a great room with a view just opposite the Sydney Opera House (SOH) so I had an excellent view at different times of the day. Sunset and Nighttime views were my favourite. Already when landing from Uluru, I had a great view of Sydney Harbour and the SOH. There are several viewpoints of this rather modern building but my favourite were from Mrs Macquarie's Chair Lookout, from the Circular Quay Station or the Overseas Passenger Terminal and from the ferry itself (heading towards Cockatoo Island or just opposite to the Luna Park) and from the Pylon Lookout (the view from the entrance - 200 steps below - is just as fabulous and free of charge) on the Sydney Harbour Bridge. While heading towards Mrs Macquarie's Chair Lookout I followed the interesting Sydney Heritage Walk and while heading towards the Harbour Bridge I followed Cahill Walk. Every day at sunset and at 9pm there's a year-round free spectacular seven minute projection, illuminating the Opera House’s eastern Bennelong sail at sunset and 9pm. It's called Badu Gili and it is best viewed from the Podium at the top of the Monumental Steps. 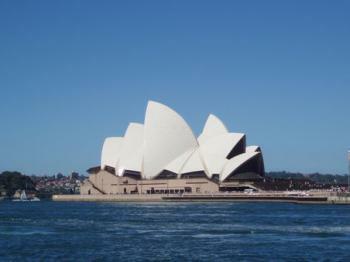 The Sydney Opera House started to be built in 1957 and it opened officially on 20th October 1973. The site had been occupied previously by Fort Macquarie, completed in 1821, and by a train depot which opened in 1903. The interior surely does not match its spectacular and iconic exterior. It's also quite expensive for a 45 minute to 1 hour guided tour and always pretty busy. Strangely enough, there's no UNESCO inscription plaque but only an information board displaying the SOH's inscription on the WH list. This is just in front of one of the lamp-posts before reaching the SOH itself (when coming from the Circular Quay Station). Apart from the mindboggling views from our room, other unforgettable moments were the cool outdoor cinema at sunset with the SOH and harbour as a gorgeous background as well as kayaking in Sydney Harbour (photo) - luckily avoiding any close encounters with the countless jellyfish and the occasional/rare bull shark. Well, what else is there to say about this WHS? It is so famous, so well-known. One of the most recognizable buildings in the world for sure, and definitely one of my favourites. I have visited Sydney twice so far (just planning my third trip for next year!) and I remember both times I first saw the Opera House. In 2007 I first saw it from the bus arriving in the city. I was so fascinated of finally seeing that building, I couldn't believe how beautiful it was, the glowing white surface against the deep blue water of the harbour. In 2010 I approached on foot from Pitt Street and suddenly saw glimpses of the Harbour Bridge between the tall buildings. I was so excited, my heart beating wildly, as if I was to meet a long lost lover. Then I did another walk along the bridge, taking as many pictures as a few years ago. I just couldn't get enough of it. Something I recommend is the tour inside of the Opera House. It was really interesting and nice to see some of the rooms inside. There were also lots of explanations about the architecture that helped me to understand the building and the background. I have been to The Opera House many times, and have always quite enjoyed my time there. It is worth visiting, even if you are not attending a show. These are reasonably priced, and always great entertainment. But, if you are spending the day there, I would suggest that you packk a lunch - the nearby food places have ridculously high prices (but some may be worth this price, if you are willing to take the fall). Next to the Ayers Rock, the Sydney Opera is the most identifiable and well-known Australian landmark, and probably the best-known opera house worldwide, at least in terms of its design. It is also a landmark in 20th century architecture, and of course, its location in exceedingly beautiful Sydney harbour is impossible to top. So any visit to Sydney would be incomplete without at least admiring the building from the outside, preferably from a ferry or a cruiseship. Having said that, I would say that this is also enough, and a visit of the interior of the building is not really necessary. It´s not particularly disappointing, there´s just not a whole lot to see. Still, when in Sydney, do as the Sydneysiders do and go to the opera! I was very happy to see the Opera House added to the World Heritage list, it is an exceptional and highly identifiable building with an outstanding setting, in a great city. The Opera House has an incredible setting backed by the Harbour Bridge on one side and the parkland containing the Botanic gardens and Mrs Macquarie's Chair on the other. This setting is iconic and, along side Prague Castle, sits as the best relationship between the natural and built environments I have seen. It is perhaps best to view the building as a sculpture for this is where its true greatness lies. The iconic shapes of it shell provide endless joy to wander around. It is a surprise to see that it is made with small hexagonal tiles instead of large pieces of metal. These tiles reflect light and in fact my first glimpse of the Opera House was when we flew over its glow en-route to the airport. The interior of the building however is does not live up to its exterior, in fact it is a bit of a mess. There is no real relationship between the outside and inside, and the acoustics are apparently quite poor. This contradiction of design may relate to the fact that the architect Jørn Utzon left the project before the interior was started. This was mostly due to political factors during the incredible 16-year building process. These factors were also part of the reason the site was not added to the World Heritage list earlier. In 1996 Prime Minister John Howard refused to support the nomination. Though at the time of inscription he did welcome its addition. Current plans to redevelop the interior with Utzon’s help may be an awkward situation for UNESCO though. There are many great places to view the structure from; Mrs Macquarie’s chair is one of the best as it places the Harbour Bridge in the background. I managed to view it from the top of the Bridge, which was a truly memorable way to see it, and also provided a great tour of the Bridge, which is very impressive in its own right. The building is not a structure that has come to prominence for being representative of a particular Modernist school, neither is it iconic for being the work of a renowned architect. Utzon himself is not going to be listed in the Pantheon of Modernist alongside Le Corbousier, Frank Lloyd Wright, Mies Van der Rohe or Oscar Niemeyer. The success of the building is derived from its own shape and location which have made it a truly iconic structure, and this uniqueness is what gives it it’s outstanding universal value and makes inscription on the World Heritage List very justified. Sydney was the first place I visited independently and I really loved it, whether it would have the same impact now that I have travelled a little more I am not sure. I do however still hold it as one of the finest ‘Modern’ cities I have visited. The Opera House and its setting are the highlight giving the city a well deserved setting on the world stage. Negative evaluation by ICOMOS, only modern structures if they've launched (or are a major example of) a distinctive architectural style. 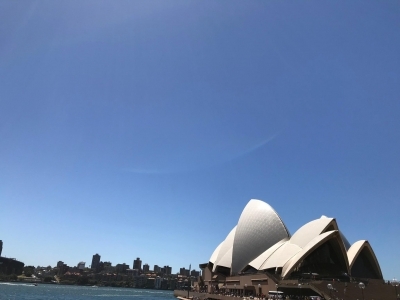 Bureau expressed interest in receiving a revised nomination for Sydney Harbour, both as a bay and as the site of the first permanent European settlement in Australia. Architectural design competitions: Utzon won a competition to design the opera in 1957. Mathematical Concepts: Spherical Geometry. The shells are derived from triangular sections of a surface of sphere with similar radius. Known as the "Spherical Solution" it became "the binding discovery that allowed for the unified and distinctive characteristics of the Sydney Opera House to be realised"
Tunnels: Pedestrian tunnel leading into Sydney Opera House Car Park - "It is the first helical underground parking station tunnels"
Built in the 20th century: Opened in 1973. 371 Community Members have visited.